I’ve heard great things about CHAOS Brew Club ever since they moved into their current place (1329 W. Grand) over a year ago. This past Saturday we decided to pay a visit, because Saturday was their 2nd Annual Stout and Chili Night. 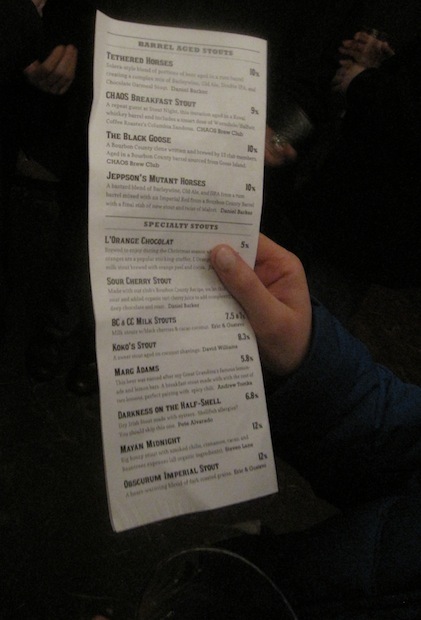 The members-only party featured 25 different CHAOS beers along with several varieties of chili. Thankfully they were running a trial membership special, allowing us to join the brew club for 2 months for just $25. After making our way down the back alley, we arrived at 7:00 PM to find a bustling party. Beers were being served both inside the brew house and outside under heated tents. Once we checked in, we made our way to the chili station inside. We loaded up on a few bowls of chili to prepare for a night of strong beers. My favorite was the Stockyard Chili, a traditional recipe of ground sirloin, kidney beans, and tomatoes. I also enjoyed a bowl of Running Wild, a spicy chili that included venison and puréed peppers. The beers for the night were broken up into 4 categories: Barrel Aged Stouts, Specialty Stouts, Breakfast Stouts, and Dark Ales & Lagers. The Barrel Aged Stouts were inside, conveniently located by a stack of barrels. 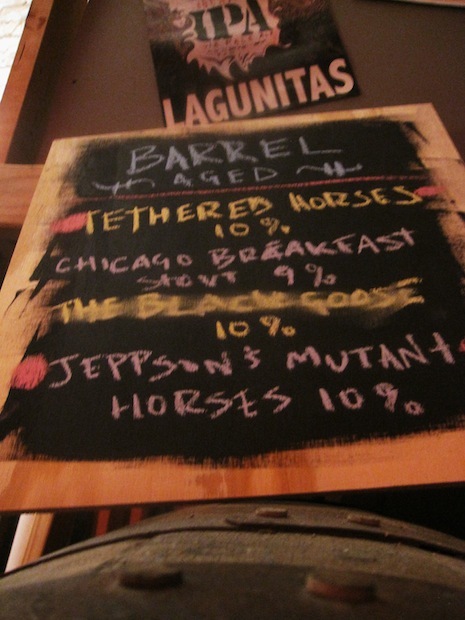 I started the night with a glass of Jeppson’s Mutant Horses, a Malort-enhanced blend of barleywine, old ale, and imperial IPA aged in a rum barrel, then blended with an imperial red ale aged in a Bourbon County barrel. Despite the Malort, this unique blend was very drinkable. I also sampled the Black Goose, CHAOS’ Bourbon County clone, and Chicago Breakfast Stout, a coffee imperial stout aged in a Koval whiskey barrel. Also inside were the Specialty Stouts. These stouts contained a variety ingredients such as orange peel, cocoa, cherries, coconut, lemon zest, oysters, and chiles. 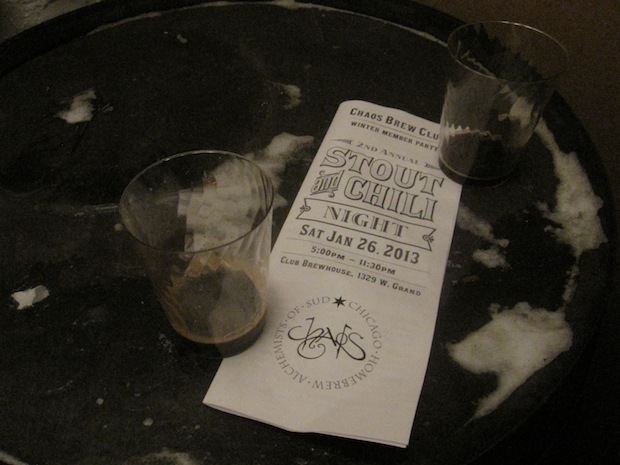 Of the Specially Stout category, my favorites were the Sour Cherry Stout and the Koko’s Stout. The Sour Cherry Stout was a sour variant of CHAOS’ Bourbon County clone with added cherry juice. Koko’s Stout was a sweet stout aged on coconut shavings. If you take your dietary cues from the Replacements, then outside with the Breakfast Stouts was the place to be. This table featured stouts with early morning ingredients like coffee, milk, oats, etc. There were lots of good beers here, but I particularly enjoyed the Morning Dew, an organic breakfast stout made with Beantrees’ espresso, oats, cacao, and raw wildflower honey. 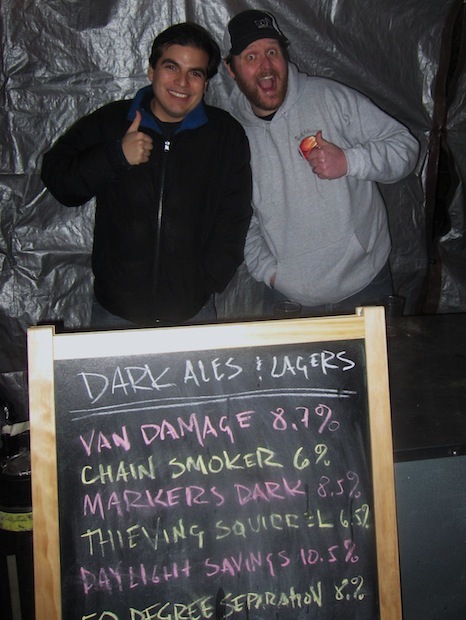 Also outside were the Dark Ales & Lagers. Although it was a stout night, these beers were definitely worth trying. Options here included Maker’s Dark (vanilla bourbon porter), Daylight Savings (dark wheatwine), and 50 Degree Separation (Baltic porter fermented with lager yeast). The standouts to me were the Van Damage, a Belgian dark strong ale, and Thieving Squirrel, a porter brewed with chocolate and toasted pecans. Definitely a great night and a great introduction to the CHAOS Brew Club. If you are looking for a little more space to brew up some beer, check these guys out.